Denver police union T-shirt: "We get up early to beat the crowds"
The Denver police union is selling T-shirts commemorating the good times they had last month. It costs just $10, which is quite a deal! 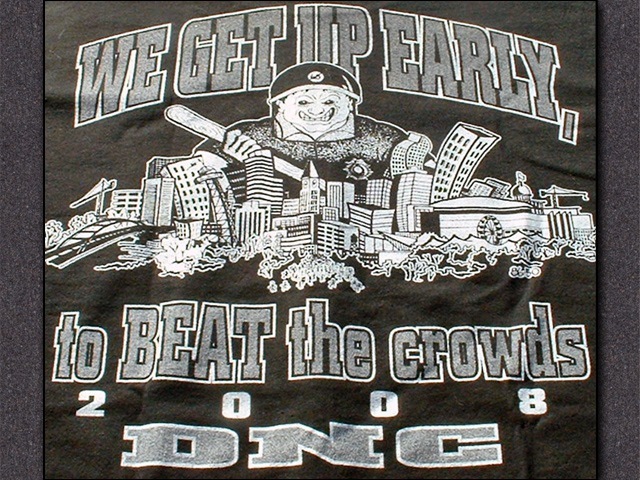 The back of the shirts reads, "We get up early to beat the crowds" and "2008 DNC," and has a caricature of a police officer holding a baton. Detective Nick Rogers, a member of the Police Protective Association board, said police often issue T-shirts to commemorate big events. Rogers said each Denver officer was given one of the shirts free and others are on sale for $10 each at police union offices. He said the union expects to sell about 2,000 of them.